Footage from video of police officer body-slamming a high school student to the floor in Rolesville, N.C.
A police officer in Rolesville, N.C., is on administrative leave after video posted to Twitter on Tuesday showed him picking up a female high school student and slamming her violently to the ground. 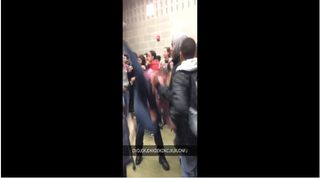 The eight-second video shows a group of students at Rolesville High School crowded together, and then the officer slams the girl to the ground. After throwing her to the ground, the officer picks her up and leads her off with her hands behind her back. Police told WTVD/ABC11 that a fight occurred at the high school earlier that morning. A second video sent in to WTVD shows the fight that led up to the incident with the officer. Witnesses say the girl who was body-slammed by the cop was attempting to break up the fight, which involved her sister. Police have not commented on either video or confirmed exactly how the girl who was slammed was involved. Rolesville Mayor Frank Eagles told WTVD that the officer, who has been assigned to Rolesville High School since it opened in 2013, has been placed on administrative leave. He also confirmed that all officers were given body cameras in August. Eagles told WTVD that the Rolesville chief of police will discuss the incident after a regularly scheduled town meeting Tuesday night. Lisa Luten, spokesperson for Wake County Schools, told WTVD that the district was aware of the situation. “We are in the process of working with Rolesville Police Department to gather all of the details around this incident,” Luten said. Wake County Public Schools used its official Twitter account to respond to the student who originally posted the eight-second video and said that it was working to investigate the matter. The ACLU of North Carolina tweeted in response to the video, calling it a “disturbing use of force” and asking anyone with information about the incident to contact them. You can view the original video below. Warning: Possibly offensive language and disturbing imagery of an officer slamming a young girl to the ground like a rag doll. The girl actually goes completely limp when she hits the ground.